On Sunday, April 24 the streets of Portland’s Old Port were bustling with people walking from restaurant to restaurant in red shoes to support Ronald McDonald House Charities® of Maine. This 3rd Annual Red Shoe Crawl hosted by RMHC of Maine and its Red Shoe Society raised over $5,200 to support the families and children served by the Ronald McDonald House Portland and Bangor. Starting at The Regency, participants registered and received their red t-shirt along with a gift bag filled with sponsor items such as sunglasses, a grocery tote, lip gloss, etc. After enjoying strawberry bites, participants headed outside on a beautiful Spring day to walk the streets for the restaurant crawl. With nine restaurants generously participating in this event, including Pat’s Pizza, The North Point, Gritty McDuff’s, Mount Desert Island Ice Cream, Coastal Maine Popcorn, Holy Donut, Crooners & Cocktails, and Thirsty Pig, the array of culinary delights was astonishing. All proceeds from this event go directly to RMHC of Maine and their mission of keeping families with sick kids together while receiving medical care. 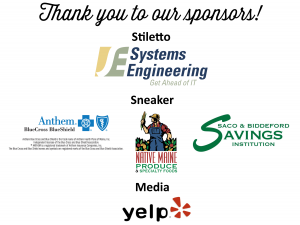 Thank you to our very generous sponsors, as this event would not be successful without their partnership. Click here to see photos of this year’s event!